If your image of ideal public life is steady as she goes, the big stories of the last two weeks will have been disquieting. They have told of fragmentation, unpredictability and disruption. These qualities are characteristic of times when established institutional processes are breaking down. The G20 meeting received most attention. The agenda of the conference was carefully controlled to focus on economic growth and to make broader issues like climate change marginal. The Australian Government clearly hoped that the meeting would also give some legitimacy to its budgetary measures. 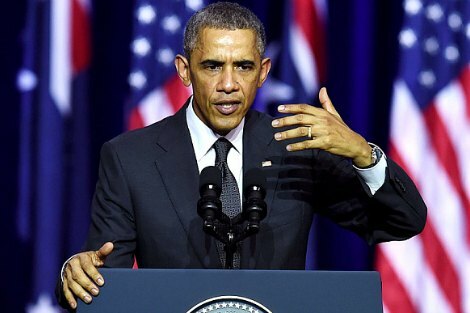 To these plans and hopes, the unexpected agreement between Presidents Obama and Xi Jinping on climate change, and Obama’s reference to the defects of Australia’s approach to climate change in his speech to students in Brisbane, caused massive disruption. Domestic and international attention was turned away from the central business of the meeting, which was the need to address climate change. When Prime Minister Abbott met French President Hollande a week later, both men sang from Obama’s hymn book. The following week senators unaligned with the major parties struck down the financial services regulations introduced by the Government. These were seen to favour the big financial players, whose reputation for benefiting themselves at the expense of small investors was already becoming noxious. The unexpected rebellion by the senators was yet another disruption of the Government’s economic policies. It also spoke of the fragmentation and fluidity of the Senate and of the obstacles it put in the way of the smooth implementation of government policy. These events might be seen to be unrelated. But I would see in them a common theme. They both challenge the belief that agendas can be centrally controlled and that good governance is constituted by discipline and sole ownership of the agenda. They suggest that the ability of political parties to impose their ideological agendas without testing them against the human values they embody is breaking down. The problem does not lie in the disruption but in the way governments act when allowed to have their way. If this is so, we should ask how we should read the signs of these choppy times. First, we should insist that governments reflect on what matters in governance and not simply on how to govern efficiently. What matters is the human good of people living now and in the future, and particularly of people who are disadvantaged. The problem for the Australian Government is that it is perceived to neglect what matters and to act unfairly. Its policies have removed protection from people who have reason to believe that large financial firms will exploit them. They have also subordinated care for the environment to short term profit. The Senators recognised that the financial regulations did not serve humane values. President Obama called the Government on the values behind its climate policy. Both disruptions pushed the Government back to reflect on what matters. Second, when people lose their trust in governance, many voices need to be heard, particularly the voices of those deliberately excluded from the conversation. The senators’ disruption to the Government gave a voice to those who have been treated badly by banks and financial agents. Obama’s disruption gave a voice to the future generations of Australians and to the world community whose voices the agenda of the G20 meeting was designed to mute. In both cases we are entitled to feel satisfied that the Government’s agenda was disrupted. Third, timely symbols are powerful. Critics often contrast them with actions that make a practical difference, and deride them. But the emission agreement between the United States and China and Obama’s speech placed climate change firmly on the international agenda. They also signalled that crude forms of climate change denial could no longer be taken seriously. If, as many forecast, an El Nino rules Australian climate in the coming years, the challenge of dealing effectively with climate change will return also with some urgency to the political agenda. In Australia, disruption of government business as normal is not the problem. The problem lies rather in areas where Governments can walk over vulnerable groups with impunity and without fear of disruption. The cruel and secretive mistreatment of asylum seekers and the Western Australian Government’s plan to rip the guts out of Indigenous communities and dump the people in townships come to mind. If these activities are the mark of governments in control of its agenda there is much to be said for disruption. Thank you for this article. I fear for Australia with the current government's inhumane and destructive policies. A study group I attended yesterday composed of retired conservative voters, listed the conduct of Australian Politics as their greatest despair. When such people have given up on the political class, things have truly reached a low ebb, and any disruption of their activity must be welcome. Well said. There is nothing more dangerous than sincere and resolute people who are acting with faulty or deficient convictions. Thanks Andy. Once again you have have reminded us of the importance of keeping humanity on the public agenda. If only our leaders could sing from that hymn book! Thank you Andrew for reminding us where true north really lies within the moral compass our navigators have ignored of late. Mr Cormann constantly reminds of the economic efficiencies we should be observing as a matter of course, "Of course", as he tendentiously reiterates, but if ever there was a minister off course it is himself. Thank you ES for airing what most Australians would regard as an essay about what we believe to be a sacred rite, ie "A fair go for all." Paradoxically though, the rump of this present government who are framing so much of this inequitable legislation, were educated in schools where the ethos of social justice was paramount. Thank you for this article. It rings true. We need more disruption especially to challenge the cruel treatment of asylum seekers. I think what any Australian government needs to display in office is wise stewardship of the nation's resources for the general wellbeing of the population in the short and long term with attention to the plight of those on the margins. Internationally I think it needs to be a good citizen on our behalf. The current federal government is faced with a long term budgetary problem which it does need to deal with. However, this needs to be done compassionately, with consideration of the less well off. The government also needs to think through all its policies and explain them honestly to the populace to obtain their support: we are a democracy, not an autocracy. By concentrating on process - such as the putative "done deal" Mathias Corrman thought he had done with Clive Palmer on FoFA - rather than getting popular approval the government has fallen flat on its face. The next "hurdle" I hope it falls over is PPL which is a very expensive prime ministerial indulgence without popular support. Honesty is a big problem for Abbott who has proved himself a master dissimulator and one not aware of it. Dissimulation and process driven politics will bring about Abbott's downfall. Thank you Andrew! disruption for the good of all, as I understand it, was the way Jesus dealt with social issues of his day. Andrew comments that “governments (should) reflect on what matters in governance and not simply on how to govern efficiently. What matters is the human good of people living now and in the future, and particularly of people who are disadvantaged.” The corporate sector must also be brought to similar realisations regarding their own responsibilities for good governance, aligned with basic human values and ethical behaviour. Almost 20 years ago (1995), Willis Harman, founder of the World Business Academy stated: “Business has become, in this last half century, the most powerful institution on the planet. The dominant institution in any society needs to take responsibility for the whole…” The continuing expansion of globalisation and the cross-border operations of large international companies have vastly increased the significance of Harman’s statement. With the corporate lobbying of political representatives and their widely-evident ability to side-step national laws, big business may indeed have garnered greater power than most governments. Harman continued: “Adam Smith’s ‘invisible hand of capitalism’ is faltering. Business needs to share responsibility for the whole. Every decision and action taken should be viewed in that light.” Adam Smith was a Professor of Moral Philosophy. His fundamental concept of capitalism assumed ethical behaviour at its core. No free market can operate sustainably without a morally ethical basis. It seems that many government and business leaders simply align themselves with a “badge” of moral responsibility (usually by professing membership of a religion or other “good” organisation), but rarely reflect upon (let alone show integrity with) the common human core values that lie at the hearts of most religions and non-religious or humanist philosophies. Increasing emphasis on the teaching of ethics to children (both within school scripture classes and secular ethics classes) is consistent with creating “the many voices (that will) need to be heard .… when people lose their trust in governance”. Spot on, Andrew! I think this was the message also of Pearson's eulogy on Whitlam. He said "reform trumped management" under Whitlam because the old man had a vision and values that put people first. One aim was "to liberate the talents and raise the horizons of all Australians". The exhilarating pace of change that followed was a sign that the policies had met the peoples needs and aspirations. Today's Governments would seem to be lacking in how to regain such momentum and change for the betterment of people. Absolute power corrupts absolutely! "the Western Australian Government’s plan to rip the guts out of Indigenous communities and dump the people in townships come to mind" - this could be put more carefully! As we know it is the federal government that has pulled out its funding of remote communities, the state governments with remote Aboriginal people are supposed to deal with this. The WA government is not planning to dump people anywhere, but is looking at a big problem and thinking how best to solve it. Can I just change a couple of words in your otherwise excellent paragraph: "They both challenge the belief that agendas can be centrally controlled and that good governance is constituted by discipline and sole ownership of the agenda. They suggest that the ability of the Catholic Church to impose its ideological agendas without testing them against the human values it should embody is breaking down. The problem does not lie in the disruption but in the way Catholics act when allowed to have their way"
Great article. It is always interesting when someone almost deified by "lesser mortals" makes comments which make the "lesser mortal" cringe with shame. Not that Obama comes in to deified category, but it seems to me that he is following in suitably deified first century AD footsteps on this matter. Agenda - disruption is not, of course a monopoly of one side of politics, secular or religious. Thus, the "conservative" Cardinal Pell expostulated at the recent Extraordinary Synod at brazen manipulation by the Synod organizers. That set in train a wave of agreement from the floor by cardinals and bishops, normally demure and respective of protocol, which effectively muddied the Synod outcome. So, despite the best attempts of the Kasperites to effect a smooth transition via procedural legerdemain to a Church with a radically novel approach to irregular marriage, homosexual acts, etc, we now have a more honest and open war, the result of which is yet to be determined. On that example alone I'm all in favour of disruption and am eager to see it stymie the manipulative program of the Kasperites over the next twelve months.